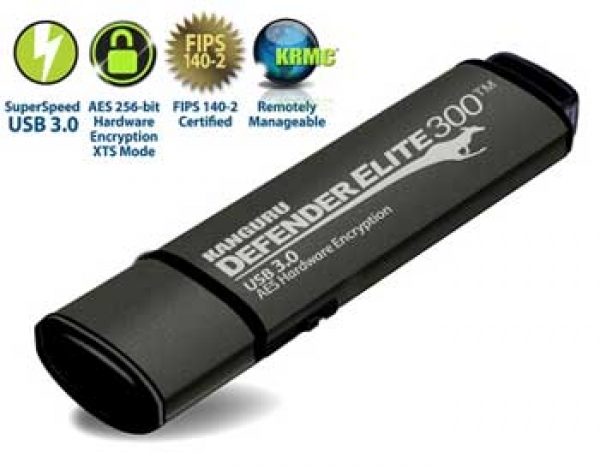 The Kanguru Defender Elite300 SuperSpeed USB 3.0 secure flash drive is designed for high data security organizations looking to meet the most demanding regulatory security standards. With AES 256-bit hardware encryption (using XTS Mode), lightning-fast USB 3.0 transfer speeds, FIPS 140-2 Level 2 certification, tamper-resistance, and remote management capabilities, the Defender Elite300 is perfect for high security environments, including government, healthcare and financial industries. The Defender Elite300 complies with the Trade Agreements Act (TAA Compliance). The Defender Elite300 has a handy physical write protect switch to easily switch between read/write and read-only protection if desired. Furthermore, all Kanguru Defender USB drives are fully protected from potential risk of 'BadUSB' with digitally- signed RSA-2048 secure firmware. Complies with Industry Security Standards such as HIPAA, Sarbanes Oxley, GLBA, etc.